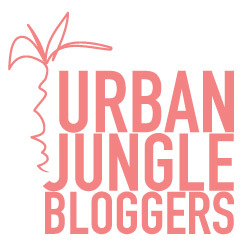 It is time for another Urban Jungle Bloggers post and this month is about giving a green gift (plant) to a friend. This month’s theme couldn’t have come at a better time. I have this friend who I tried to introduce to Tillandsia, but she just wouldn’t have it. “What?!! Plants that don’t need soil?” She thought they were a bit too freaky. To be fair, I was showing her pictures of T. bulbosa and the like. However when I showed her a picture of T. xerographica, she began to warm up a bit to air plants. Of course, I should have started with that. I mean, who can resist a T. Xerographica? I let her know if I ever came across one, I would grab it for her. I am thrilled to say that day arrived and I have a beautiful xerographica to give her. I phoned her to let her know I have something for her but did not tell her what. I hope she doesn’t read this blog post before I see her. Either way, she will be thrilled. 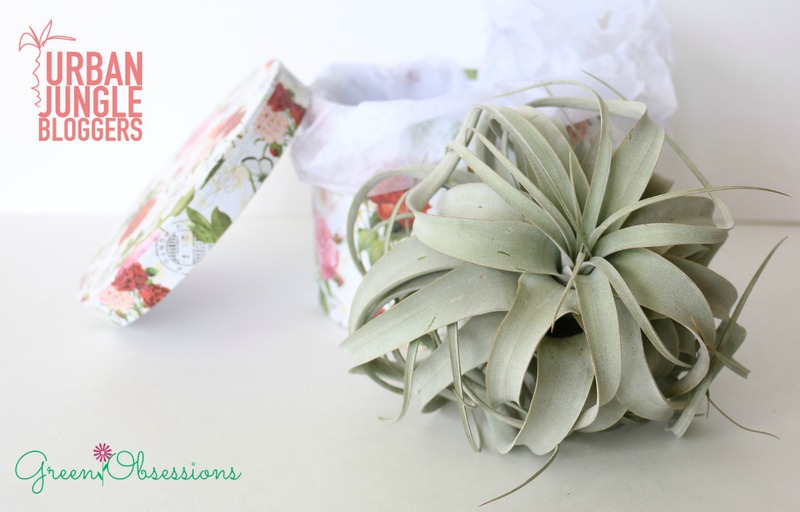 Air plants are great to give as gifts. If they are small, they can be given placed in glass orbs, little dinosaur planters (make your own) or himmeli structures (DIY here). If they are large like the xerographica above, they can be placed in shadow boxes, macrame hangers etc. The possibilities are endless as Pinterest boards show. Looking at a Xerographica always takes my breath away, so for this green gift I thought it would be best to let the plant speak for itself and just present it as is. It can be placed on a shelf, on a coffee table or dinning table on its own without other enclosing structures taking away from its magnificence. 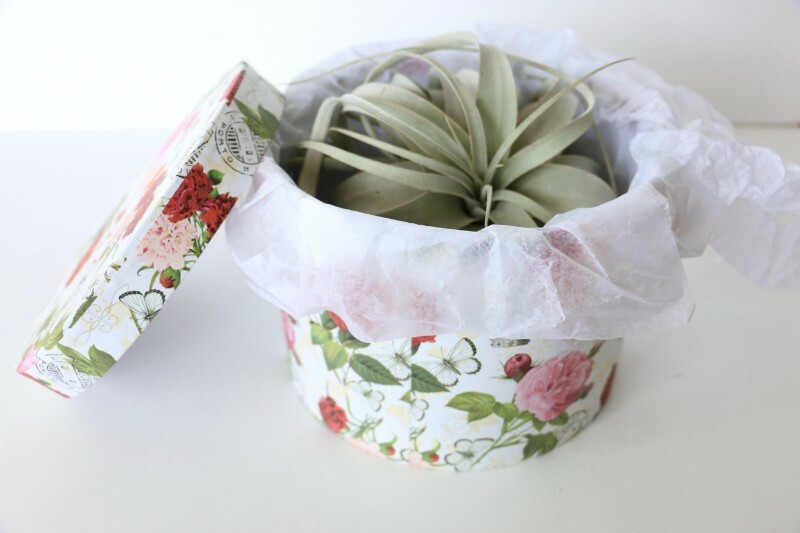 I simply placed the air plant in a colourful gift box along with an air plant care tips sheet. What a surprise it will be when she opens that box. I think my friend will begin to appreciate the beauty of air plants with this simple gift. Don’t you? What creative ways have you given plants to family or friends? It’s a great gift and a beautiful presentation! I loved the links to the DIY ideas and can’t wait to go to the dollar store in search of dinosaurs! I am glad. Let me know how it goes! Thanks Abi. I love them too and hopefully my friend will fall in love with them as I have. Now that’s a cute surprise when you open the box!! 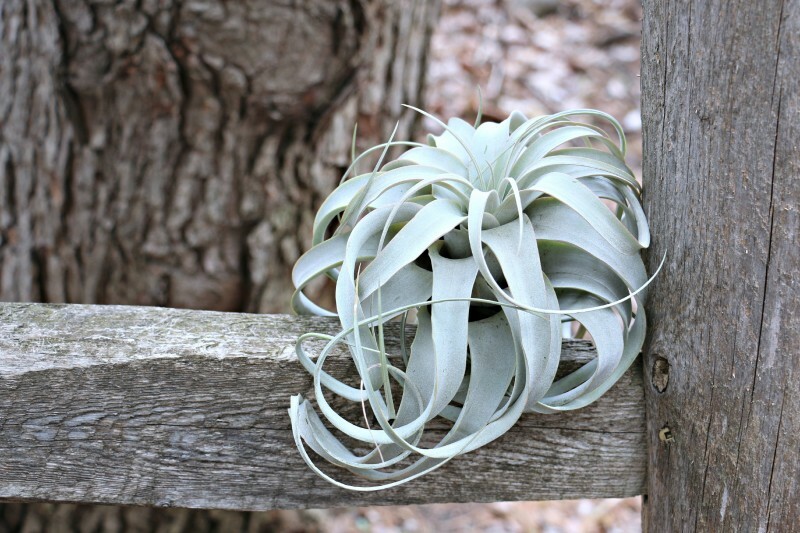 Love the airplant! Thanks for joining us!